The Supreme Court has ruled that for now, citizens do not have to link their Aadhaar numbers to a range of services including bank accounts and mobile phones. The top court said that a biometric ID is mandatory for accessing social welfare schemes and subsidies, but till it decides on whether the government's demand for Aadhaar to be linked to private and public services is a violation of the right to privacy, the 12-digit unique number given to each citizen does not have to be linked to other services. India launched Aadhaar, now the world's biggest biometric database, in 2009 to streamline welfare payments and reduce wastage in public spending. Since then, the government of Prime Minister Narendra Modi has been keen to mandate the use of Aadhaar for everything from filing income tax to the registration of mobile phone numbers and booking railway tickets. 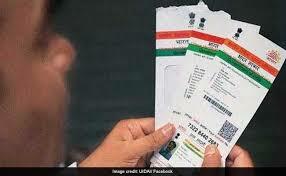 Aadhaar is now mandatory for welfare, pension and employment schemes. The top court's stand today means that a deadline of March 31 that was earlier declared for bank accounts and mobile phones to be linked to Aadhaar has now been extended till it decides on whether the Aadhaar Act is illegal. A group of petitioners have asked the Supreme Court to declare the government's insistence on Aadhaar disclosure as a violation of the right to privacy. In August 2017, the Supreme Court ruled that privacy is a fundamental right, but made it clear that the decision on the constitutional validity of Aadhaar would be taken separately. The government says the Supreme Court, in that verdict, accepted that privacy is a fundamental right, but subject to reasonable restrictions. Critics are worried about repeated data breaches and say the ID card links enough data to create a full profile of a person's spending habits, their friends, property they own and a trove of other information.